As is usually the case, the run-up to the Christmas holidays is extremely busy and we find ourselves once again approaching another anniversary; on the 28th of November Lightworks will be Sixteen. Its been a great year with some very varied, interesting and challenging commissions and projects, all of which have been squeezed into our schedule around the years largest project; the design and production of our Neptune commission. Completed in late September, the piece is now in secure storage awaiting installation in 2015. Our programme of works up to Christmas is now primarily concerned with the completion of the St. Mary’s Catholic Technical College commission featuring “Our Lady Queen of Heaven”. 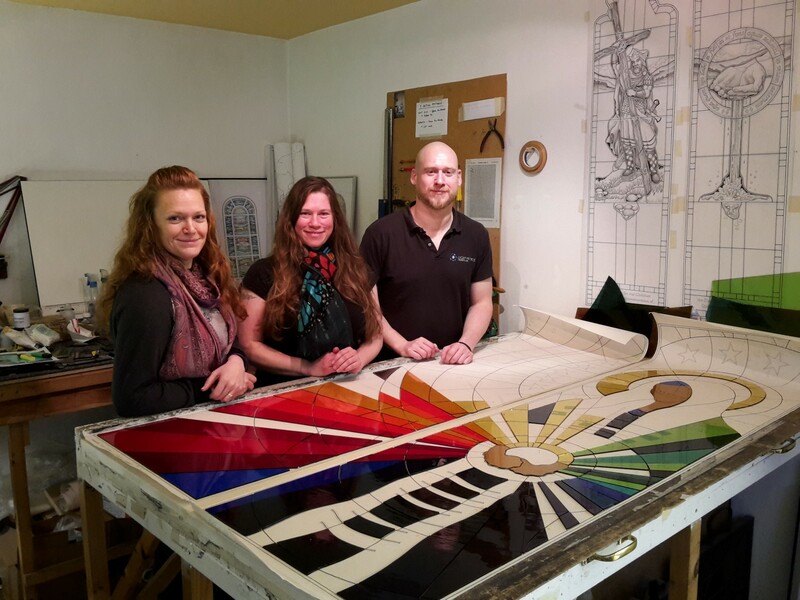 It comprises three large panels (500 x 1900) making up a whole and is due for installation within a brand new oak frame in the schools chapel before the end of term. With two separate orders in place for new ecclesiastic commissions, one for St. Mary’s RC Church Haslingden and the other, All Hallows Church in Bispham (both due to begin production early in the new year), designs currently being produced for commissions in Berkshire and Northhants and various other restoration/conservation projects ready to start, 2015 is already shaping up to be another incredibly busy year. Included in this will be our ever popular “Stained Glass Course for Beginners”. scheduled to begin again February. On behalf of Deborah and I, we’d like to thank all our clients, course attendees, contacts, and suppliers, with special mention to all at Pearsons, Alison Wren at Paprika Marketing, Scott (the Gaffer| Wolstenholme at Danley Engineering and Simon Howard at Simon Howard Glass Studio all the way down in South Wales.